The high valual parent and basic seeds must be stored under the right air-conditions and in well protected rooms. Therefore, those rooms (seed vaults) must be foreseen from both thermal- and fire-isolation. Either Agratechniek or your own supplier can make sure that the right seed vaults will be build. The seed vaults will meet the requirements, by using the right materials and components. 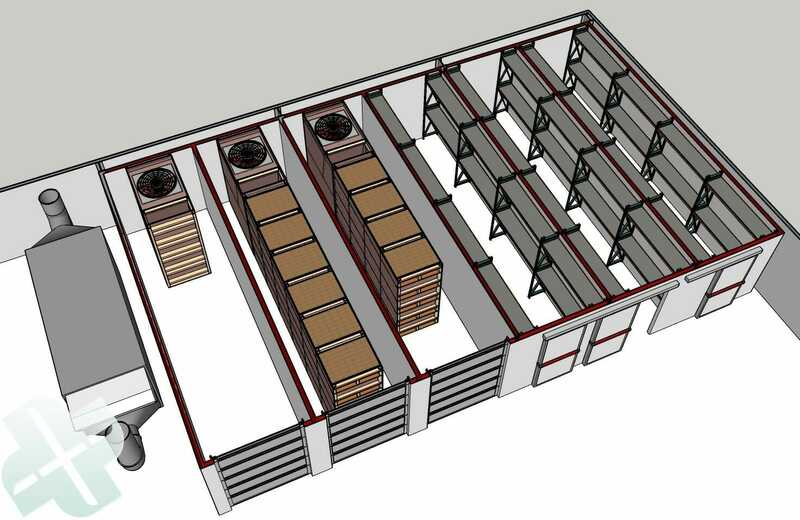 Example of a cell block with three drying cells (left) and three seed vaults (right). For long-term storage of the seeds, dry air with a low temperature is required. Therefore, it is necessary that the room will be refreshed with dried air whilst keeping the temperature low. 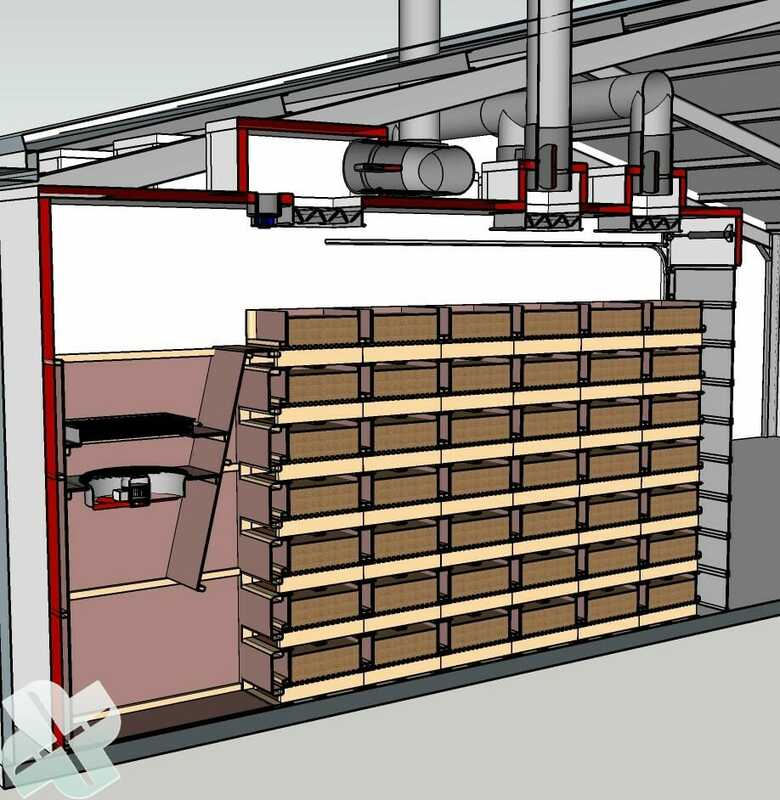 A hybrid air-dryer with an extra post-cooler is the best and most economical solution to provide the needed dried and cooled air. The hybrid air-dryer (condensation and adsorption) with post-cooler provides a low moisture content at a low temperature. For example 15 T°C/59F° with 20% RH or 10 T°C/50F° with 30% RH. To achieve this, the seed vault must be completely damp proof. Thanks to the ABC processor, the central air-dryer will take the air automatically to every room or installation where it is desired. By doing this, every room is kept under the right conditions. These conditions for drying cells are different from the conditions of seed vaults. Profile of a seed safe with air valves; control valves for amount of air and fire valves for permanent seal if there is smoke development or fire. 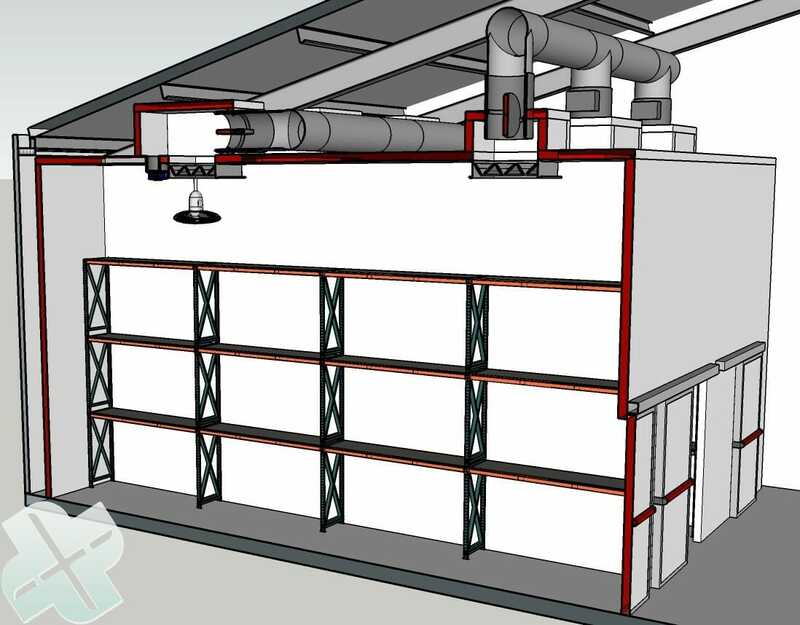 Image above: A central hybrid air-dryer distributes the dried air and cooled air to the different rooms (cells). In this way, every cell can be kept at a low moisture content (2 – 3 gram water/kg) and a low temperature; a condition of 10 T°C and 30% RH is possible by that. Because this air-condition will always be drier than the environment, the air from the cell will be recirculated and again brought to the desired condition. This saves a lot of energy. Image on the left: Air-channels and valves ensure that the dried and cooled air will be blown into the cell. A circulating fan distributes the air equally through the room. A refreshing fan can bring constantly (if required) fresh air in the cell. Because of slightly overpressure, the moist air will stay outside the cell. • On the middle-left, import of fresh air; a fan will take care of the necessary refreshment with fresh air. • In the middle, inlet of dried and cooled air. The controlling valve under the ceiling decides automatically the amount of supplied air. A circulating fan distributes the air in the vault. • On the right, outlet of the air because of overpressure. This controlling valve is connected to the inlet valve. At every in- and outlet, a fire valve is adjusted. The ABC processor ensures that they will close automatically if there are any problems. The red line marks the fireproof shell of the cell. If there is any smoke detected or fire mentioned, the ABC processor ensures that the fire valves will close automatically. If the valves are closed, all the inlet openings are completely closed and are part of the fireproof shell. Besides that, it is recommended to have an external sprinkler system. 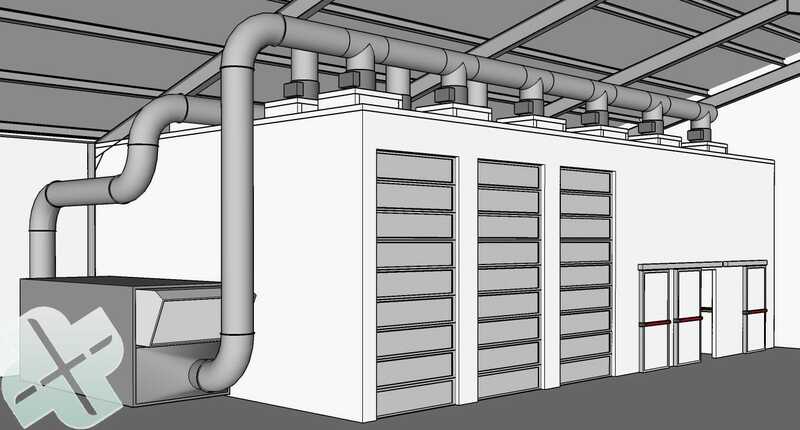 One central air dryer can provide several cells and drying installations of dried and cooled air. For drying seed, different air conditions can be set.